PostFrame Manager isn't intended to do engineering. What PostFrame Manager does is enable you to quickly and easily produce a material list that is a result of engineering requirements. At the same time, it provides a rendering of the building that is constructed virtually as a sales and concept verification tool for your customer. That said, PostFrame Manager can automatically drive values that are known to vary based on engineering requirements. Let's say a building in a 30# snow load area requires the following per your engineer. 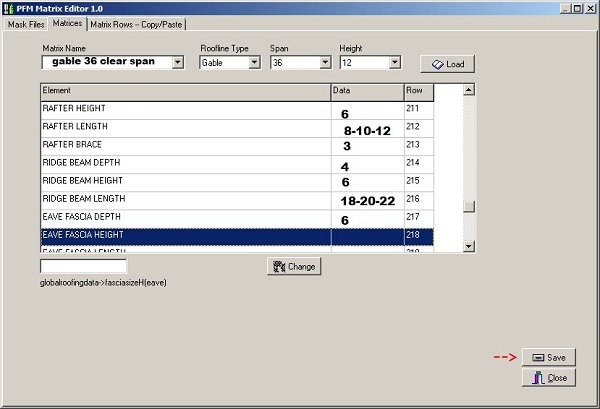 With the parameters set up, PostFrame Manager can automatically specify these things. When you draw a building - any size - these engineering requirements are automatically applied to the finished building. The same thing applies to other values that vary per engineering specifications - purlin spacing, bottom chord bracing, web bracing, truss X-bracing, wall bracing, etc. - PostFrame Manager can drive any structural settings. With presets being triggered in this way, you (or your employee) are always in the correct ballpark of materials vs required performance. The idea is to have control of the most critical attributes. You can set up the required lookup tables yourself, or call us for support and we can get this done for you. PostFrame Manager is designed this way to allow the user to get a solid materials list, price, construction drawings, and a customer quote in just a few minutes. It takes a long time to do these things manually. And PostFrame Manager never forgets to follow all of these engineered rules.